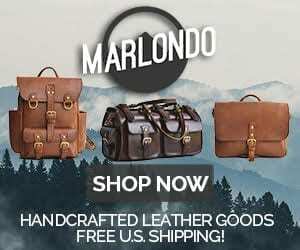 The first time I went to E3 Supply Co’s website, I thought my web browser had auto-filled in a website from my history–why was I going to a page about motorcycles? I was in the right place though. E3 began by making custom motorcycles, and carried that spirit of freedom into making killer leather accessories. 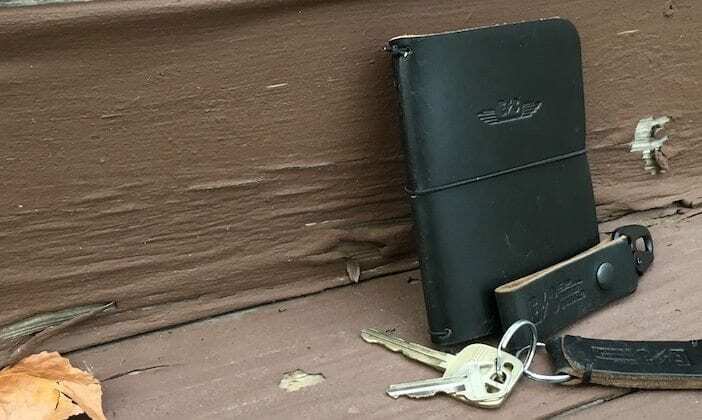 We’re going to look at a couple items that would fit right in with any biker’s every day carry–E3’s Passport Notebook and Tactical Keychain series. There’s lots of great options out there for a small leather notebook cover. E3’s Passport Notebook is distinguished in that it’s kept very simple (no card or pen slots), but can hold two smaller Scout notebooks. The Horween Chromexcel used is nice and thick, and as soft yet strong as we’ve come to know and love of this leather. It looks great and E3’s wing logo is very cool. Elastics at the centerfold are used to hold the notebooks in the cover, and another elastic is used to keep it closed when not in use. This is a great system that makes the Passport Notebook very easy to use. It’s quick to pull out and jot notes when the moment comes, and with some flexing can lay nice and flat. One unexpected use I found when I only needed one notebook was to use the freed-up elastic to hold cash or receipts. A drawback about the elastics is that they’ll be far outlived by the Chromexcel, but they should be quite simple to replace once they wear out. Everyone needs keys, and every key needs a good keychain. E3 offers two options of their Tactical Keychain, and I’ve had the chance to test out both. V1 is for those who prefer to clip their keys to their belt loops, and V2 is for those who like to snap the entire keychain to their belt and unclip their keys when they need them (or perhaps those who want to save a few dollars on the less expensive of the two). I’ll let the visible wear-in on mine show which I preferred! 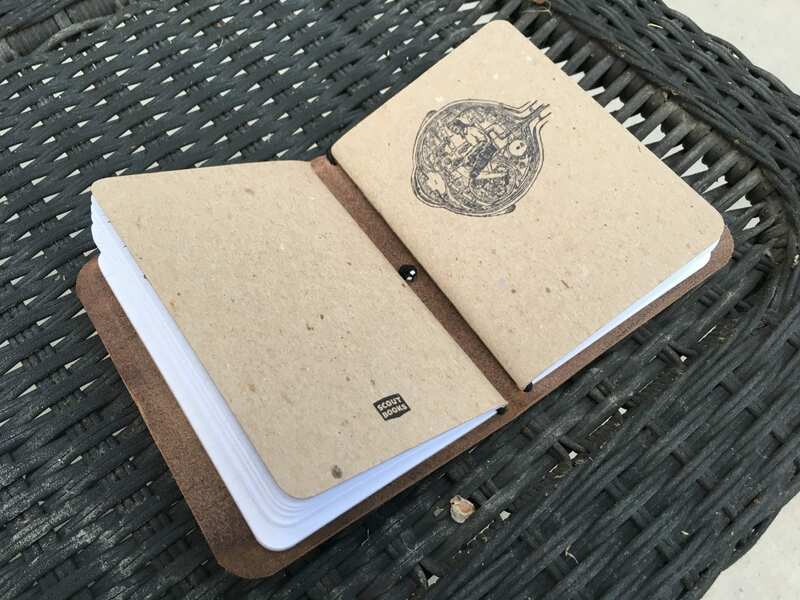 Both versions are well made with the same thick Chromexcel as the Passport Notebook. V1 uses a thick stitch at each corner to hold three folded layers of leather together and the hardware in place, and V2 uses a single snap rivet to keep its two layers of folded Chromexcel in place. Hardware is military spec Hk style rifle sling clips. The PVD coating on the clips is starting to wear on the contact points of my clips, but this shouldn’t affect function or longevity. Everything involved is tough enough to handle the abuse a keychain takes for years to come. E3 Supply Co. is a cool company with some great products. Their Chromexcel Passport Notebook and Tactical Keychains are simple, well put together items with our recommendation. Prices are reasonable as well–the Passport Notebook is $45, and the tactical keychains are $39 for V1 and $29 for V2. E3 has many other great accessories to offer, as well. Be looking forward to a review of their Holster Style Slim Wallet in our upcoming wallet roundup as well as a review for their Apple Watch straps in the coming weeks.